There is a powerful gravitational pull to this earthly realm. We get so full of the earthly “stuff”. There is a call to rise up as on the wings of the eagle (Isaiah 40:31). As we choose to lift our gaze and press into the Presence of God through Jesus Christ, the Holy Spirit Eagle dusts us off and all that earthly “stuff” falls back to the realm to which it belongs. 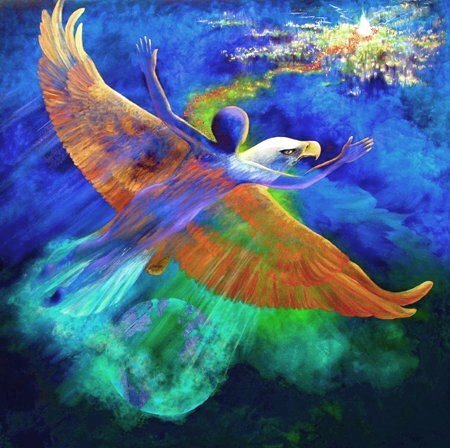 We soar effortlessly with no striving or grasping. We rise above the battle in the spirit realm. We are protected. Our God is our fortress and shield. Fixing the gaze on the Source of all goodness and wisdom brings great peace and ability to live on the earth with “perceptions from the heights”. When we see life from God’s perspective, we have the discernment to know what has true value and priority. t becomes a life characterized by FLIGHT.